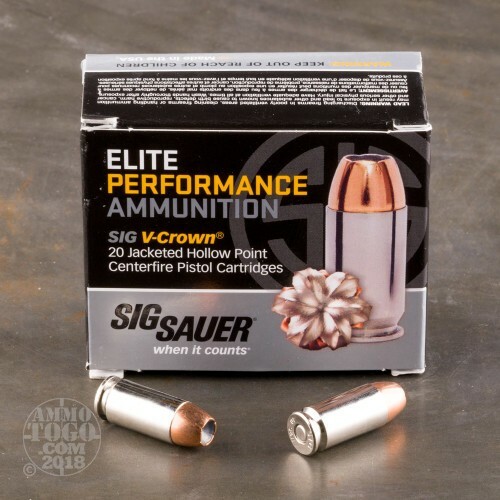 This is 40 S&W Sig-Sauer Elite Performance Ammunition 165gr. 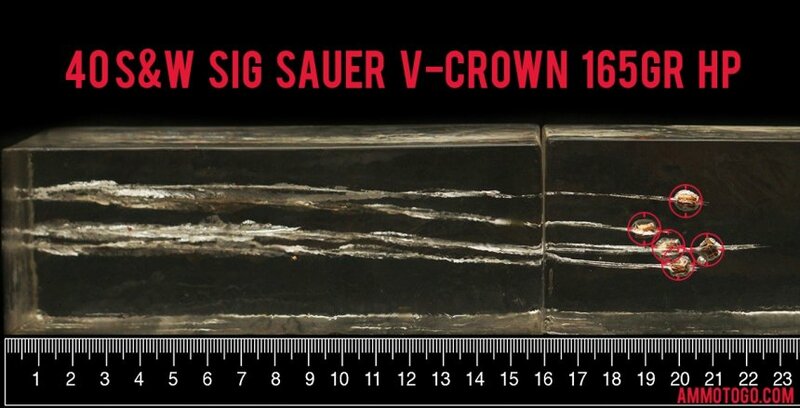 V-Crown Jacketed Hollow Point Ammo. 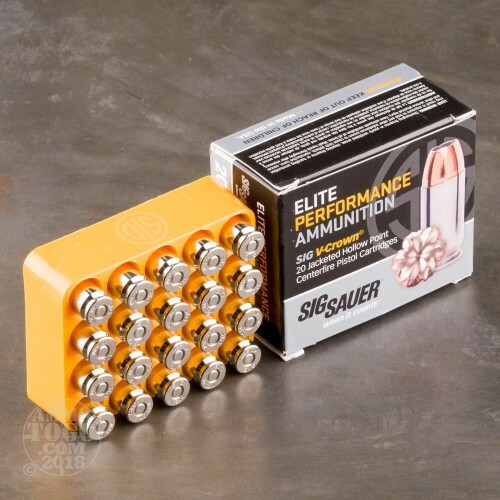 With Sig-Sauer's recently released Elite Performance Ammunition, you can now have the precision you expect from your Sig-Sauer firearm manufactured into your ammunition. 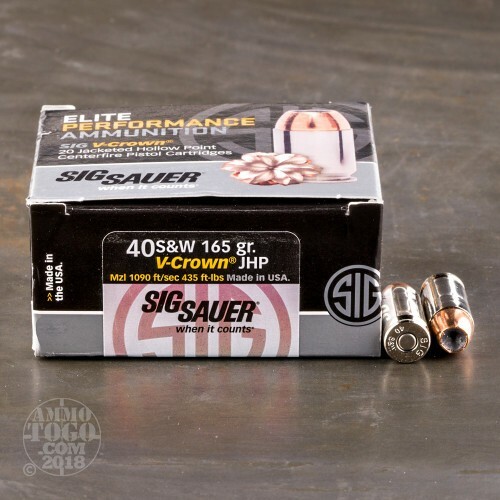 Made in a Sig-Sauer owned facility right here in the USA, the V-Crown JHP topped rounds provide an excellent balance of penetration and expansion across a range of velocities. This ammo is brass cased, nickel coated, boxer primed, non-magnetic and non-corrosive. This ammo comes packaged 20rds to a box. Muzzle Velocity: 1090 fps. How do the results for this Sig Sauer 40 Smith & Wesson compare to other 40 S&W? 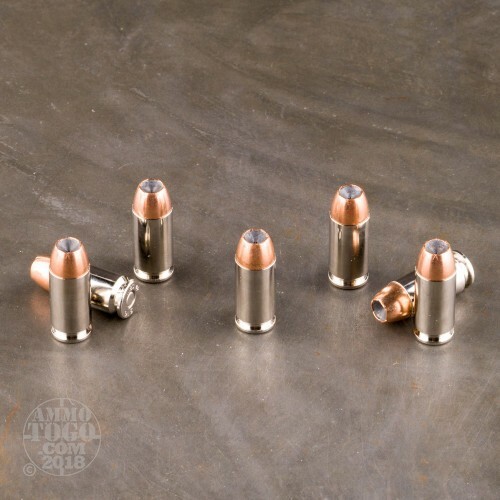 Expansion Diameter Compared to All 40 Smith & Wesson Ammo Tested MIN 0.39" MEDIAN 0.65" THIS AMMO 0.49" U.S. dime MAX 0.89"
Penetration Depth Compared to 40 Smith & Wesson Tested 0" 10" 20" 30" MIN 9.8" MEDIAN 16.5" THIS AMMO 20.3" MAX 32"